A tasty green bean treat. 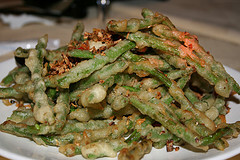 As with other recipes there are many variations of fried green beans. Actually the second one we've posted seems more like true "fried" green beans to us, but the first recipe works well too. If we use bacon fat in the first recipe we don't add the lemon juice/zest. Heat the olive oil/fat and butter in a skillet over medium heat. Add green beans, lemon juice and garlic salt. Cook until the beans are tender but still a bit crunchy, approximately 10 minutes. Remove from heat. Salt & pepper to taste. Add lemon zest over top. Wash and trim green beans. Pat dry. Mix the flour, salt, pepper and garlic powder in bowl. Dip the green beans in buttermilk and then roll in the flour mixture. Deep fry until golden brown. Drain on paper towels.